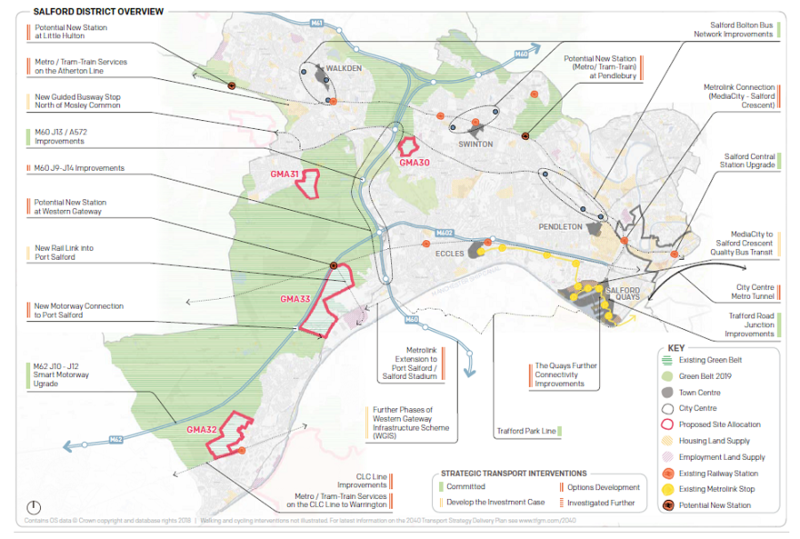 The first draft of Greater Manchester Spatial Framework (GMSF) was published in 2016 and the consultation attracted over 27,000 responses. Green Belt land was being released when there was a lot of brownfield land that could be used instead. The majority of development over the plan period will be on land within the urban area, most of which is brownfield land. Within the plan period 87% of housing, 96% of offices and 50% of industrial and warehousing development is within the urban area. The scale and distribution of development required to meet the needs of Greater Manchester will necessitate some greenfield development and the release of a limited amount of land from the Green Belt. Development in the Green Belt will be dependent on the appropriate transport and other infrastructure being provided and Green Belt policy will continue to apply for uses other than those outlined in the allocation policy. In Salford 483,584 square meters of brownfield land will be made available for office space and 586,758 square meters for industry and warehousing. Policies to maximise the use of brownfield land and build at higher densities in the most accessible locations have helped to reduce the total amount of land required for new development. The GMSF Revised Draft 2019 supports regeneration of our town centres, particularly as locations for new housing. National planning policy does not support a ‘brownfield first’ approach. Local Authorities are required to be able to provide a 5 year supply of housing sites which are available and deliverable. If Greater Manchester cannot demonstrate that it’s brownfield land is available and deliverable (which is something that most of the 10 LA districts currently struggle with) then they are required to identify other land which is – this may be Protected Open Land or Green Belt. Greater Manchester Combined Authority are adopting a ‘brownfield preference’ approach, doing all it can make sure that brownfield sites come forward in the early part of the plan period however to do this they need to continue to press Government for support to remediate contaminated land, to provide funding for infrastructure and to support alternative models of housing delivery. This is why discussions on the Housing Package are vital and why they need their bids to the Housing Infrastructure Fund to be successful. The Greater Manchester Green Belt currently accounts for 47% of Greater Manchester’s overall land area. The proposals in Greater Manchester Spatial Framework: Revised Draft 2019 would result in a Green Belt covering 45% of Greater Manchester. In addition to the Green Belt, important ‘Green Infrastructure’ has been identified– for example, parks, open spaces, trees, woodlands, rivers and canals which provide multiple benefits and make a huge contribution to the quality of life, promote good mental and physical health and supports economic growth. The strategic Green Infrastructure network in Greater Manchester is extensive. Around 60% is within the Green belt and therefore is afforded significant policy protection. The remaining 40% (20,000 hectares) does not meet the tests of Green Belt but it is very important for the continued wellbeing of the city-region. This plan seeks to give stronger protection and priority to this land at a strategic level. The detail of this will be developed in district local plans. Taking the extent of Green Belt and Green Infrastructure together, over 60% of Greater Manchester’s land would have an enhanced level of protection from development. The plan sets out proposals to support the Greater Manchester ambition to be a carbon neutral city-region by 2038. A key element of this is to require all new development to be net zero carbon by 2028 and to keep fossil fuels in the ground. At this time, therefore, Greater Manchester authorities will not support fracking. Greater Manchester Combined Authority are also seeking to deliver a net gain in biodiversity assets over the plan period and to contribute to improving air quality primarily by locating development in locations which are most accessible to public transport, seeking to expand the network of electric vehicle charging points and restricting developments that generate significant pollution. The government has directed Greater Manchester authorities to produce a Clean Air Plan to tackle Nitrogen Dioxide (NO2) concentrations and bring them within Limit Values in the shortest possible time. The ten districts have chosen to do this collectively and an Outline Business Case will be presented to GMCA and submitted to Greater Manchester authorities for approval in 2019. Most people accepted the need for housing to help to address the housing crisis but considered that the 2016 Greater Manchester Spatial Framework would not deliver affordable housing to meet the needs of local people. The plan sets a minimum target of 50,000 additional affordable homes to be provided over the plan period. A new housing strategy will be developed to provide more detail on the type and mix of housing required as well as developing a definition of ‘affordable housing’ that works for Greater Manchester. The proposal is to build 50,000 affordable new homes with at least 30,000 being for social rent. The highest population growth in Greater Manchester is expected in Salford and Manchester. In Salford, the proposal is to build 32,680 new homes between 2018 and 2037. This is an annual average of 1,720 per annum. The Strategy sets out ambitions to deliver good quality, high-skilled jobs. Ongoing work on the Local Industrial Strategy will develop this further. This plan seeks to provide land to meet the widest range of employment opportunities to ensure that Greater Manchester remains as competitive as possible in a global economy in uncertain times. The majority of new jobs will be in the City Centre and wider Core Growth Area stretching from Port Salford in the west to the Etihad campus in the east as well as around Manchester Airport. This area encompasses established employment areas such as Trafford Park, locations such as MediaCityUK which has seen strong growth over more recent times and our Universities which are driving growth in world-leading research and development. This plan will create more favourable conditions for growth by providing sites for advanced manufacturing, digital and tech jobs in areas where the urban land supply cannot support the scale or quality of development required. The employment land has reduced by about 25% compared to 2016 GMSF. Many of the responses raised the issue of the impact of new development on existing infrastructure. As the majority of new development will be in the urban area, the capacity of the existing infrastructure is particularly important. An Infrastructure Strategy for Greater Manchester will be developed over the next 12 months. More work has been done looking at the transport and other infrastructure that will be required. Proposals for new Metrolink stops, development of orbital public transport links and capacity enhancements to the rail network all form part of the overall package of measures identified. The 2040 Transport Strategy Delivery Plan 2020-2025 has been published in draft alongside the new draft GMSF which sets out all the transport projects that are hoped to be achieved in the next five years to ensure that the planned new housing and employment can be sustainably integrated into Greater Manchester’s existing transport infrastructure as far as possible. More than 65 transport projects will be delivered in the next five years, including Metrolink’s Trafford Park Line; the purchase of 27 new trams; an upgrade of Salford Central Station; £160m new walking and cycling infrastructure across all ten districts; expanding the city-region’s electric vehicle charging network; and new interchanges in Tameside and Stockport. Greater Manchester’s Plan for Homes, Jobs and the Environment is the strategic spatial plan for Greater Manchester and sets out the planning policy framework for the whole of the city-region. Districts will continue to produce their own Local Plans setting out more detailed policies reflecting local circumstances. Once Greater Manchester’s Plan for Homes, Jobs and the Environment is finally agreed all of the Greater Manchester district local plans will be required to be in general conformity with it. East of Boothstown (the area between Boothstown & RHS Garden Bridgewater) for 300 new dwellings which will primarily be low density and at the top end of the housing market. The proposal also includes retaining Alder Wood, and Allotment Plot and a play area. Port Salford extension (to the North and West of Barton Aerodrome) which aims to move freight from roads. The development may include the loss of the golf course but will retain the greenbelt to the West and East of the site. It will also provide 500,000 square foot of employment floor space. You can read the executive summary and the full report here. To get involved in the consultation, follow this link. This briefing was produced as part of our voice and influence work - VOCAL. 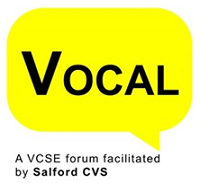 To find out more about our VOCAL forums visit this webpage.